Once again faced with an obligation to take some days off (vive la France), I decided to take a small tour of part of the Loire river. This time, I'm not alone! Benoit decided to join me. 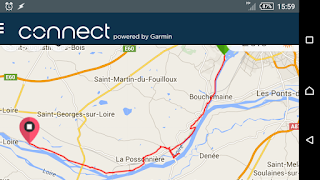 The tour is from Angers to Nantes, mostly following the Loire river, but with a deviation to Clisson, where we will visit some friends. 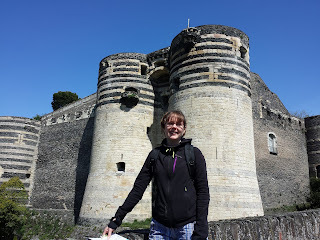 Sunday morning we took our bikes and ourselves to Angers, by train. 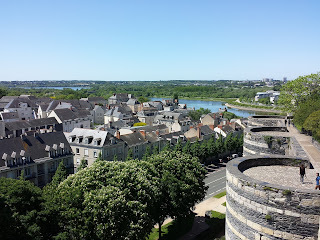 It wasn't a cycling day though: we spent the day visiting the city of Angers, mostly the castle. The weather was beautiful - even on the hot side. 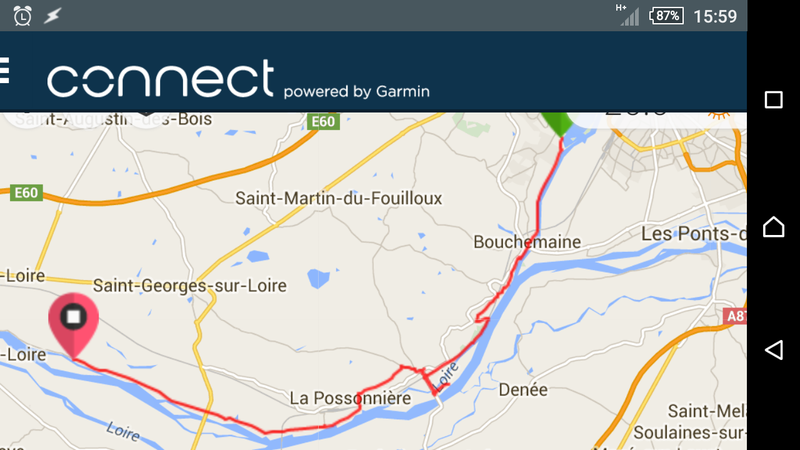 Today, we cycled from Angers to Saint Germain des Prés, just over 30km. This is a popular route for cyclists, and there are signs indicating the cycle route, the whole way. Part of the road was a bit rough, the road covered by small rocks. A mountain bike wouldn't have any problem. However, our bikes are hybrids (vtc in French) - with tire thickness between mountain bike and racing bike tire widths. We made it through those parts of the route without getting any flats, but I'm not sure a road bike would handle the terrain well. My bike has, for each brake, a tiny screw near the brake barrel adjuster and the brake lever. As you screw it in, the brake lever closes. I guess the purpose is to have the brake levers closer to the handlebars to minimize the reach required by your fingers, to brake. At some point, I'm guessing due to the vibrations on the rough road, this screw, on the rear brake side, managed to screw itself all the way in, thus leaving my brake lever practically completely closed and my rear brakes always on. The fix is of course simple : simply take the Allen key of the correct size and unscrew (or remove completely) this (useless) screw. Unfortunately, I didn't have the right size Allen key. I had two other keys, but not that one (thanks, Murphy). One of the two keys I had allowed me to find a workaround, though: I loosened the cable clamp bolt (near the brake pads), then loosened the cable which allowed me to separate the pads from the rim a tiny bit, and tightened the bolt again. It was good enough. Just after this quick adjustment, we went to a park to have lunch. A couple of cyclists there had all the imaginable tools you might need, and they were kind enough to lend me the right Allen key so I could do the proper fix. 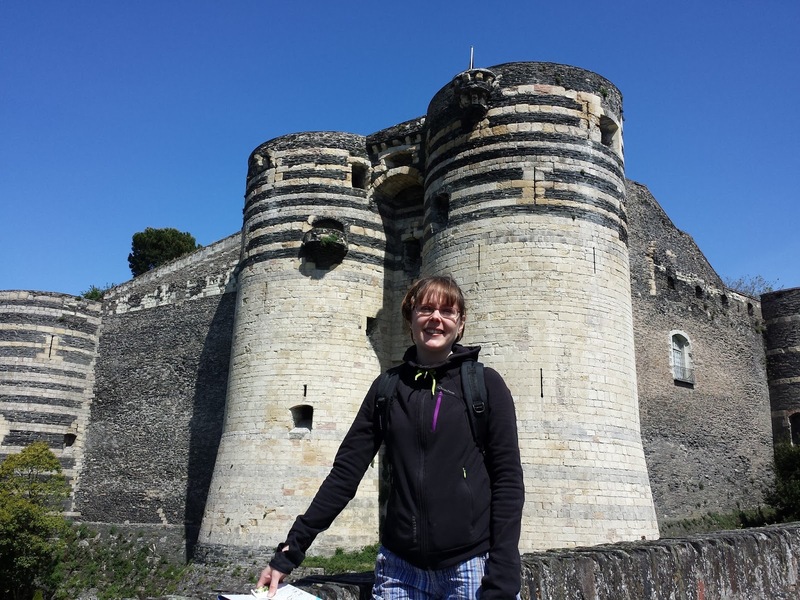 They were on a Nantes - Angers - Nantes tour. 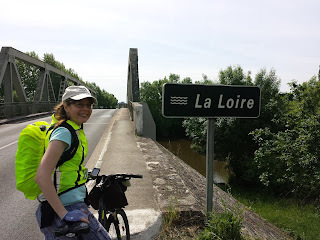 I guess if you're ever going to need some help from fellow cyclists in France, the Loire route is one of the best places to be. We also met a Danish couple at the Angers hotel who were on tour. I don't know where they had been already, but they were heading to Paris. This tour has gotten off to a good start: beautiful weather, nice roads (except for the little bumpy part), mostly flat route, no wind, almost no traffic at all, and beautiful scenery. Didn't see these posts till just now, but I am looking forward to reading through. Good job adjusting your bike clamp. That kind of ingenuity is all that's needed to feel confident out on the road.